Shirts With Random Triangles: Report: Lousiville interviews Bobby Petrino for head coaching job. Report: Lousiville interviews Bobby Petrino for head coaching job. Bobby Petrino back in the day as Louisville HC. Via Rock City Times. From the "Least. Shocking. News. Ever. Of the week" dept. come reports from ESPN's Brett McMurphy that Louisville has interviewed its former head coach Bobby Petrino who is currently HC at Western Kentucky to replace Charlie Strong. McMurphy sites sources that claim Louisville athletic director Tom Jurich on Tuesday. 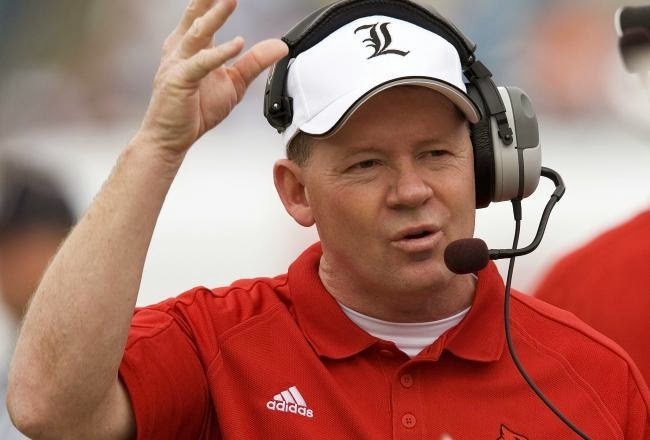 Petrino previously coached Louisville from 2003 to 2006, before leaving on one of the strangest journeys for a college football coach in history. He coach the Atlanta Falcons for a year, just in time for the Michael Vick dog fighting scandal. He quit the team before the 2007 season ended to take the head coaching job at Arkansas. He coached the Razorbacks from 2008 to 2011, when he was fired following the events of a motorcycle accident involving himself and a school athletic department employee whom he was having an affair with. He currently coaches at Western Kentucky, which he led to a 8-4 season and wins over Kentucky, Navy, and Arkansas State. McMurphy reports that Stanford defensive coordinator Derek Mason, Clemson offensive coordinator Chad Morris, and Michigan State DC Pat Narduzzi have also been interviewed for the Louisville head coaching job. That means Petrino returning to coach the Cardinals is far from a done deal.